My name is the beginning point of my communication method in a totally new place like Australia. After one semester, I finally could sit down to tell about my doubt over the way I chose. Unlike most of Asian students, I keep my Vietnamese name – Trang, resulting in owning no English name. In fact, I could anglicize it easily, at least more easily than most of my Vietnamese friends, as my Vietnamese name could be translated directly into English maintaining both meaning and structure closely to the original. Most non-English students I know anglicize their names often end up with either adopting English names they like or sounding similarly mere a part with their real names, such as Tâm – Tammy. 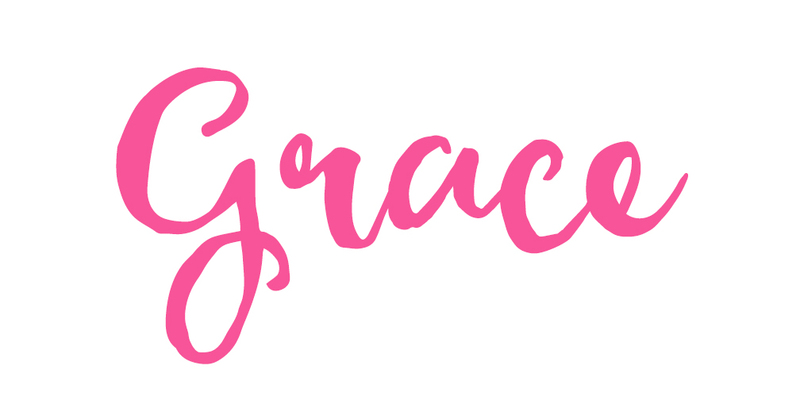 But my name, Trang, which owns identical meaning, one syllable and similar tone in another English’s name – Grace, is a piece-of-cake case. So why I don’t use it despite all of the convenience if I were to compare with my friends? Also, how does such matter drive me crazy with my communicating with others? First of all, I think I emphasize too much on individualism. I insist on keeping my real name, which reminds me of who I am and where I come from and refuses to change. This responds to my fear of a cultural assimilation and an irresistible temptation towards “the sugar-coated bullets of the West”. That is, losing my cultural identity and involving too much with capitalist lifestyle, which is often negatively seen as full of materialism and consumerism from the view of most Asians. Such fear I suppose, is due to the moral panic commonly shared by many people staying overseas, whose adoption of a passive perception on culture clash, that people from a different culture often feel being under attack by other cultures in globalized world, leads to a strong resistance of “exotic” culture influence I brought with me when I arrived in Gong. Second, I expect a fair-shared pay-off effort from all parties in a communication process. Saying that means, I want to be acknowledged in a conversation, in which I attempt to get to know them and vice versa, others do the same to know me. Usually, international students use English names to make it less difficult for English native speakers to handle. It’s understandable somehow as English is an international language, so a majority of the world’s population studies it and get familiar with English names. While I know that fact, I can’t help feeling that it seems like English speakers are often more passive in the communication process. By using my Vietnamese name, I could provoke mutual eagerness-to-know with whom I strike conversations with. In this way, efforts coming from both sides in a talk could meet and the communication process could flow, which helps me to break the ice and make more friends easily in an English-speaking environment. Another reason is somewhat extremely subjective, in which I must admit I didn’t give enough thoughts to it. I assume that my name – Trang, is simple enough for anyone to call. This default conception comes from the fact that my name consists of only one syllable and have no tones in my mother tongue. Vietnamese is a tonal language and there are six tones added to words, which trouble lots of foreigners while studying to speak it, and the tone (thank không – no tone) my name owns is the easiest of all. After a while staying here, I figure out “Trang” is more difficult to pronounce than I have imagined. While the vowel “a” stays the same in Spanish or similar to how people say “r” in English, most Australians I first meet might actually pronounce it /ae/ if they never hear me introducing myself before. Even after I try to correct them, some still can’t get it right. My host is in such situation, though she is very serious and tries hard to say my name, she still ends up saying Traeng/Treng instead of Trang. A funny thing is her son-in-law’s name is Tren(ch), so whenever we share/stand under the same roof, it becomes to mispronounce and mishear names of each other. 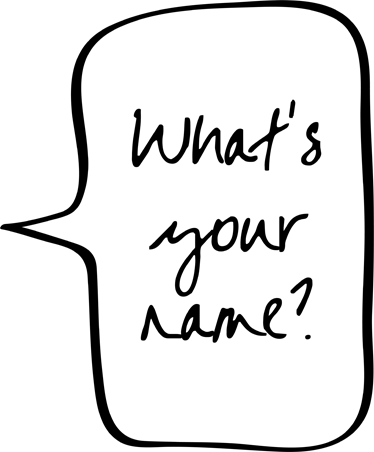 By using real name, on the contrary to my expectation, I ended up creating a communication barrier, which I first mistook as a language barrier with others. I guess it is either I have a lot of patience to carry out till the very end, or I might be too stubborn for not changing my method, even after writing this. I don’t mind whenever I have to spell my name to sign up for a club, or repeating it several times so people could say it right, as I’m more than happy and welcome, considering their efforts to understand me, but others definitely don’t view it that way. As people are afraid to call my name, they choose not to say it, might be because they struggle with it, or simply don’t want to hurt me by mispronouncing it, yet I doubt that through the time, they even forget it (I explain in my below situation). Instead, they just start a face-to-face conversation with me by saying “hey” and “you”, as far as I could notice. Saying that doesn’t mean every Australian friend of mine is like that, since there are still a number of people who can say my name correctly, in which I really feel welcomed. I fully appreciate such a small thing they do, though people might not notice. Anyway, I know I can’t blame anyone for that, but I can’t help feeling hurt. What’s more, my confusion of the communication approach I have taken, and whether I’m troubling others, constantly upsets me, even till now. The longer I keep doing this, the more I feel clueless and lost. I remember an experience in which I couldn’t blame anyone but might be just myself. It was in the BCM110 class where we had a group presentation. Sue (my lecturer and also my tutor) randomly put us into different groups, in which I settled down with 3 other Australian friends. In our group, we then broke it down into 2 pairs to work. My partner was a lovely girl who was in the first year like me. Long story short, our group all work via Facebook. When her and I wrote the script for our speaking parts, she noted my name as “Minh”. “Minh” is my middle name and this was easily mistaken as my first name because of the difference in word’s order and social etiquettes I have on my account. Anyway, I didn’t disappoint with it, as she didn’t know these things, and at least she tried. She then realized her mistake and apologized, and asked for how I wanted be called. I was more than glad to tell her, expecting that this time she got it, as it was shown clearly in my FB nickname. Unfortunately, once again she wrote it wrong. She typed “Chan” instead of “Trang”. I could get it if people have troubles with the pronunciation, but writing/typing, especially my name is there on top of the box chat, and it only contains 4 word, and even you can’t remember, just copy+paste will do, I suppose, but my friend failed doing so. 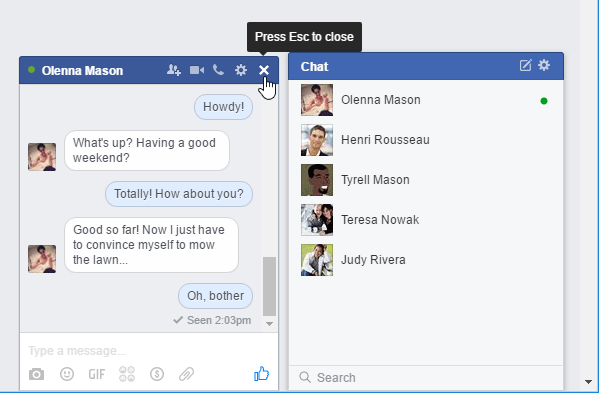 An example of FB’s box chat. I mean names are clearly presented, so what’s the problem? Now, just back forward to the very first day our group was formed. We actually had a chat to get to know each other. We talked about ourselves and goals in this course, and even explained the origins of our names as Sue suggested. I thought I had explained mine well, even more detailed compared to the above. At that time, I didn’t expect my team members to even remember my name, but since we added each other on FB, I hoped that by the time working together, we could know more of each other. At the end up the day, I realized that they might even not remember my name after all efforts building a group and preparing for the presentation. This time I was really sad, when no one knew mine while I knew all and even their names’ origins. Since that moment, I can’t stop questioning if I had expected too much in a talk, either it is an online or offline, and whether my method of communication so wrong that I ended up feeling embarrassed, un-confident in raising my voice and excluded from the community. After that….After? No, there is no after. The result of our relationships could be summarized with us still being “friends” on each other’s FB’s friend-lists . They are nice people, no doubts. While we were working in group, we supported and listened to each other well. However, my over-thinking ability couldn’t let me through and finally ended up with my self-blaming issue as usual. Just to sum up, I guess I’m no good at keeping in touch with people. After our performance, I didn’t go to the class in the last 2 weeks of the autumn session, because I didn’t know how to face them. Rather to say, I was scared to see them. “Where should I sit in the class? Would they sit with me or with other friends because we have finished as a team? And even we manage to do that, who are they to me and vice versa? Are we friends, teammates, classmates, acquaintances or strangers?” – All those questions spring up in my mind whenever I think about it. 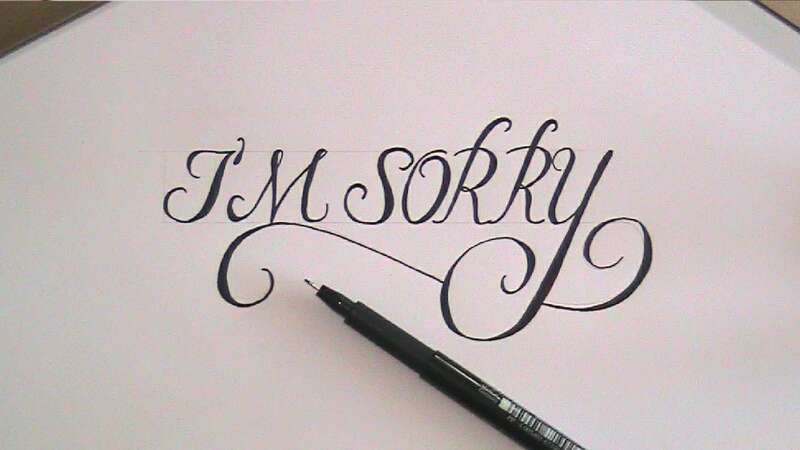 Here, I believe I owe Sue a sincere apology. After the first day of my absence, I sent her an email, lying that I was sick and asking about class activities. She replied in details and didn’t forget to wish me well. At that moment, I felt that she actually gave me strength to have courage to go to class the following week. But I was a coward and I escaped, breaking my promise with her that I would come in the final week for revision. I knew, I let her down, as I sent her an email to explain for my act, but of course, it wasn’t as honest as I’m confessing my sins now, and she didn’t say a word while she usually responds emails quickly. I kept wondering since then and finally decided to have an English name, like everyone else studying abroad I know. I was almost close to shake off my Vietnamese part to blend in, then I came across this blog post, which actually opened my eyes. Surprisingly, my friend, chị Minh Anh, whom I often seek advice from, that she has an English name, is fluent in English, a good writer and seems never to have problems with communication, actually concerns she is white-washing herself. This makes me realize that, whatever I do with my name, communication barrier is a huge challenge to any overseas students, especially when their destinations are distinctly different from their motherlands, must overcome, sooner or later. Her case and mine are similar, yet our approaches contradict. While she immerses herself too much in the Western culture, I avoid it too often. From her writing, and my reflection, having both names seems to be the best of both world, as long as my priority is still “Trang”, that I’m fully self-conscious of what I represent, but not “Grace” (please see Nick -Hậu Hoàng’s part). As Mia proved in her blog, when learning and using another language, people often take on another identity, I think this way is easier for me to adapt more quickly in a new environment. So this is my anxiety of my name and my communication at Wollongong. Along with that, is my wonder of my own choice in studying Communication and Media Studies. I’m certain that, I’m struggling at communicating, yet I’m studying Communication at university. After a term, I’m more keen on of what I am learning, though I’m picking up things slowly. But hey, better late than never, right? I recently have started to figure out how to accept my inner-self, embrace my weaknesses and strengths, and stop being afraid to learn more to socialize with all of my skeptical mind and over-thinking problem , even it takes me a long while to blend in. I am Trang, and also called Grace, but as you can see, “Trang” always comes first. I hope that, Grace could be another start – a detour for people to talk to me if they first could not find the shortcut. After all, strangers shall be friends and we could sit down to drink tea together, as you would explore the “Trang” part in me, and I could understand who you are. So sweet of you to mention my little piece of writing here, Trang ^^. We do share so many thoughts in common, and I see part of myself so clearly just reading this. I love all the quotes you included here, especially the one by Winston Churchill – just on point, and I’m amazed by how much thought and effort has gone into the making of the post. Keep up the good work, sis! I feel so fortunate to have come here more or less by accident (following up something else) and read this beautiful post. There is so much to say about all of this, but I really want to think about how our names become part of our survival in complex systems. It’s the most personal thing that we carry into our professional or studying lives. Thank you so much for writing this, it has been a great honour to read it. Oh boy. I’ve just read about your first year group experience and it makes me very sad and regretful that this caused you so much pain. However, the very good thing about this is that we will take tho=is on board as we introduce a new set of students to group work. Care for each other in any kind of educational or working situation is paramount. We have to change the practice. So thank you for being so honest and sharing this. You have much to teach us.